We’ve picked up another product that is unique amongst treats. It’s a cheese treat that contains…wait for it…real cheese. The other ingredients? Cheese. It’s called Cheese Please and is made from 100% Wisconsin Cheese. No corn. No wheat. No soy, and grain free. When our first shipment arrived in the store, I was asked to sample the product. Not my dog, Lily… me. I was skeptical but I dutifully popped one into my mouth. It was crunchy and…good! Tasted like sharp cheddar cheese. I offered one to Lily who promptly agreed with me. Of course she wanted more. Each ingredient used in any Complete Natural Nutrition product is hand-picked for nutritional integrity, efficacy, purity and long term health consequences. Their ingredient statements are transparent and easily accessible – they hide nothing. 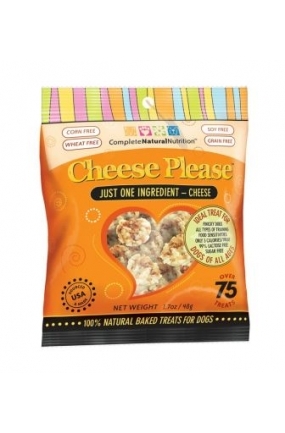 Their treats use very few ingredients and they follow a strict philosophy that ‘less is more’ – ‘simple is better’, just like Mother Nature intended. They believe that dogs and cats are eating way too much processed food, too much sugar, too much salt and too much refined carbohydrates – all things you will never find at Complete Natural Nutrition. We have other products from Complete Natural Nutrition in our store as well. Anyone who has bought the Pill Buddy Naturals knows the quality of the product. We are very pleased to be able to offer their products and we hope you stop by and try some. Another product that has received little recognition is the WeRuVa Brand. It is an up and coming company that is run by a husband and wife team. Their products are unique because they are manufactured in human food factory. Here’s a story written by the owners, David and Stacie Foreman. We proudly present WeRuVa, a luxurious, natural pet food inspired by and named after our three rescued cats, Webster, Rudi and Vanessa. With our search for “The Best Cat Food Under the Sun” never seeming to end, we thought, “Lets give it a shot ourselves…” so we gathered the best ingredients from around the world, formulated some fantastic recipes and created it ourselves. Naturally, when we were lucky enough to have our rescued dog Baron enter our family, we decided expand our products to include dog food . WeRuVa made it’s name known for their cat food. Our customers’ cats love it so when they announced that they had introduced a line of canned dog food, we had to try some. Please stop by the store and try some!